When these two friends heard there was a shark flailing in the waves, they didn’t run the other way – instead, they offered the animal their help. Colin Baker and his friend Adam were enjoying the weather, fishing on Jensen Beach in Florida, when someone said that there was a distressed shark flopping in the waves. The duo approached the creature and found that it was tangled in fishing wire with a hook in its mouth. The friends moved quickly, unraveling the twine and carefully pulling out the hook before hauling the shark back into the surf where it was able to swim away safely. 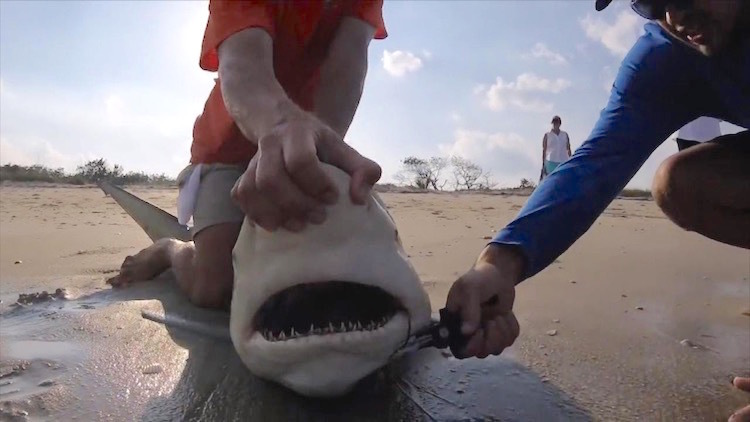 Very nice to see any humans actually helping a shark, instead of just killing them!